The newly-discovered subsurface ocean on Saturn’s icy moon of Enceladus is similar in makeup to some of the life-bearing salt lakes on Earth, a new US study suggested. Astrobiologists believe this small moon is the best place to search for alien life in the Solar System. The 505-kilometer-wide satellite is geologically active, with powerful geysers blasting through its ice shell. 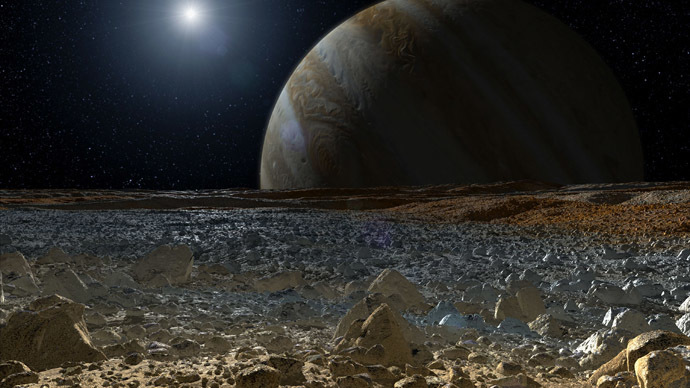 Those geysers contain water which researchers suggest comes from an ocean located beneath the moon’s icy surface. A new paper entitled ‘The pH of Enceladus,’ published on Wednesday in the journal ‪Geochimica et Cosmochimica Acta, looks into the chemical reactions that occur as Enceladus' ocean water comes into contact with its rocky mantle. The authors based their research on data gathered by NASA's Cassini spacecraft, which has been orbiting Saturn since 2004. 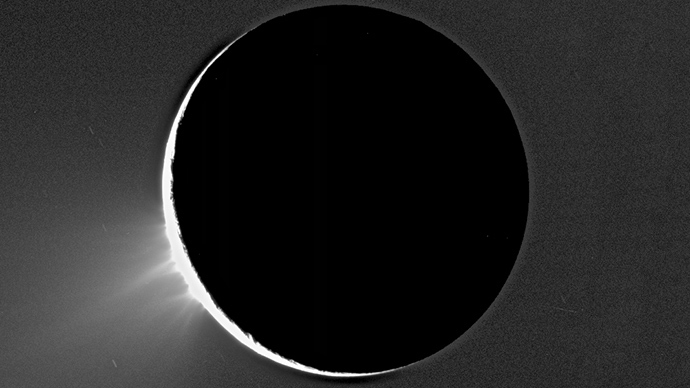 They used mass-spectrometry measurements of the gases and ice grains in Enceladus’ plume to develop a model that estimates the saltiness and pH of the water in the moon’s inner ocean. According to the US team’s findings, the ocean on Enceladus is likely salty and has a basic pH of 11 or 12, neutral pH being 7. The same pH levels are found in ammonia-based glass-cleaning solutions, but some organisms on Earth are still capable of living in such conditions. The high concentration of sodium chloride (NaCl) makes Enceladus’ ocean resemble terrestrial ‘soda lakes,’ such as ‪Mono Lake in California. It’s good news for the those hunting alien life as a the fauna of Mono Lake includes brine shrimp and many different microbes. The team’s model suggests that the ocean’s high pH is explained by serpentization, a process where metallic rocks from Enceladus' upper surface are transformed into minerals due to contact with water. "Molecular hydrogen can both drive the formation of organic compounds like amino acids that may lead to the origin of life, and serve as food for microbial life such as methane-producing organisms," the study’s lead-author Christopher Glein, from the Carnegie Institution for Science in Washington, said in a statement. Glein described serpentinization as a link between geological processes and biological processes on the moon. "The discovery of serpentinization makes Enceladus an even more promising candidate for a separate genesis of life," he stressed. The hidden ocean was discovered on Enceladus earlier this year by Italian scientists from Sapienza University in Rome, who also analyzed Cassini data. They said that active hydrothermal vents are likely to exist on Enceladus’ seafloor, providing conditions similar to those that gave rise to some of the first life forms on Earth.